GUSTAVO REQUE: A Life Dedicated to Well-Being. Interview By A. Reque. PRIVATE LESSONS. By Mike Clarke. THE POWER OF 'KAGE ZUKI'. The Hook Punch: By John Cheetham. YOUR FEAR IS MY POWER. By Dr Bill Laich. A CULTURAL DIFFERENCE. By Clare Worth. 'GET MOVING': Training with Harada Sensei. By Jonathan de' Claire. THE LONG STRETCH. By Aaron Hoopes. 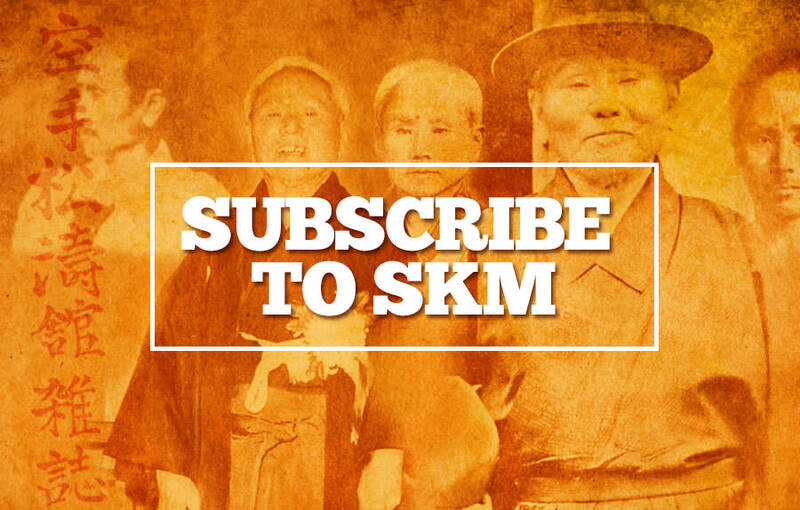 Welcome to the first issue of 2005 and Happy New Year to all SKM subscribers. When you read stories of martial arts masters of old, you often learn that they were also 'healers' or 'doctors' as well as teachers of the fighting arts. In fact one interpretation of the word 'sensei' is doctor or healer and not simply 'teacher'. 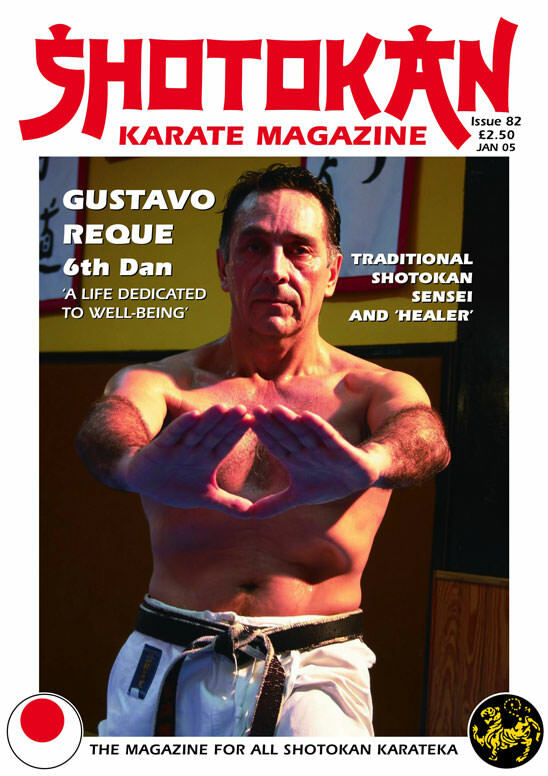 Sensei Gustavo Reque, a 6th Dan Shotokan instructor is a modern day incarnation of such a martial arts master. They are a very rare breed! After recently suffering a chronic shoulder injury for six months and spending a fortune on treatment, with virtually no improvement whatsoever, came my timely introduction to a very special karate sensei who also happens to be an extremely sort after Osteopath. After four visits my shoulder was seriously on the mend and in the process I had met a really genuine human being and most interesting man. I am always amazed to find that it is not necessarily the 'famous' karate masters who are the most interesting and have positive, worthwhile things to say, but it's very often the less well known people who are the most fascinating. Sensei Gustavo Reque is a 57 year old karateka, who's dojo in Marbella, southern Spain, has been established since 1972. Himself and both his twin sons Adolfo and Gustavo Jnr (both 3rd Dan) teach at the dojo five nights a week. Gustavo works as an Osteopath at the Centro Reque clinic in Marbella which has operated also since 1972. People travel from all over Spain and Europe for Gustavo's very highly regarded professional treatment. Gustavo is also assisted here by his sons who are both qualified Medical Doctors as well as being qualified in Osteopathy. Gustavo Reque is not only a superb karateka technically with a wealth of knowledge and experience but equally, if not more importantly, this man is a 'healer' and a follower of the 'Way' of Karate-do. Bill Laich's article is educational and food for thought and needs a very careful read but is a fascinating insight into the human aspect of training and how we cope with fear. Here he examines, 'the fine line between courage and cowardice' and asks questions like; emotion supplies energy, but energy for what? What does fear have to do with courage or cowardice? Fear is an emotion supplying energy, but energy for what? Anger is an energy, but energy for what? Rarely do we read about ordinary Japanese karateka training in other countries; it's usually the other way around, with tales of western karateka living and training in Japan. 'A Cultural Difference' is a story and a look into how two experienced Japanese karateka adapted to life and training in England. They trained at my dojo for over two years and for us it was a lesson in humility! It is with great sadness that I inform the readers of SKM that the legendary Shotokan Master, Taiji Kase 9th Dan passed away at his home in Paris on the 24th November 04 at the age of 75 after being ill for some time. SKM will of course be featuring a special tribute to Kase Sensei in the next issue of the magazine (April 05). Sensei Kase, a direct student of Gichin Funakoshi and his son Yoshitaka was a major figure in the world of Shotokan for the past 50 years. Osu!